Enova Gives: Volunteering for One Million Degrees - Enova International, Inc.
As part of our Enova Gives initiative and giving back to the local community, Enova sponsors One Million Degrees, providing opportunities for employees to serve as mentors. Volunteers at OMD coach Illinois college students from low-income households who have shown high academic potential. In September of last year, I received an internal memo showcasing Enova’s involvement with the program and highlighting the need for volunteers. I learned that the commitment is relatively straightforward — a monthly 2- to 3-hour meeting with the mentee, with additional meetings at the discretion of both mentor and mentee. I applied for a coaching role and, after a background check and an interview with one of the OMD Directors, was assigned a student. This was my first time being a mentor, and I found that it’s a lot like being an older sibling. In this case, I had more or less been through what my mentee was going through: An immigrant to the U.S. from South Asia, on the verge of graduating and entering the workforce. We met once a month for a few hours, in addition to scheduling technical sessions focused on strengthening his job application. We also worked on improving his Excel skills and discussed tips for the interview process. The coaching process is very humbling. The biggest challenge in being a coach isn’t technical — it’s finding ways to motivate and inspire your mentee to achieve their professional and academic goals. I learned from my student about the difficulty of assimilating into American society when your English is less than stellar. I also learned a lot about myself and my own tendency to project what I think is best on to my mentee. In the end, I’m very proud of what my mentee has achieved, both academically and professionally. We didn’t always meet the goals we set for each month, but both of us are very happy that we decided to engage with each other. Being involved with One Million Degrees has helped both of us to be better people and give ourselves the best chance of succeeding both personally and professionally. If you’re an Enova employee, you can visit Enova Gives to learn more about One Million Degrees and other programs that Enova sponsors. If you would like to support a charity financially, Enova will even match your donation (subject to certain guidelines and limits). 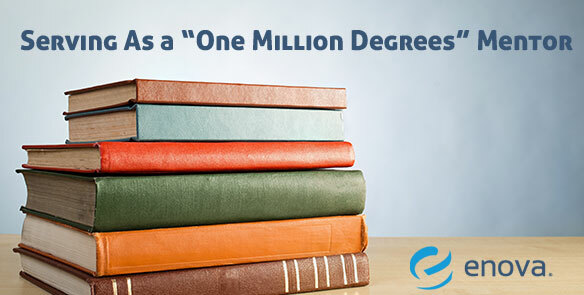 Even if you’re not an Enova employee, you can learn about various ways of getting involved at One Million Degrees here.